March Movement! Move Your Body! Join today to set yourself up to thrive. Home / fitness / March Movement!! Here’s the deal: There are 31 days in March…move your body for at least 20-minutes a day, every single day in March. That’s it. Commit to moving your body every single day in March. Join March Movement and you’ll have exclusive access to a private FB group, with daily prompts, motivation, my favorite YouTube workouts, hot-seat coaching and more!! So, if you want to be a part of a supportive community that is ready to take March by storm and MOVE IT, then join me. Enroll for only $27…less than $1/per day! March is about movement — March Movement! It’s no secret that exercise is good for you – not only for you physically, but also for your mental wellbeing. While what you eat is important, no amount of kale will make up for inactivity. Regular physical activity controls weight, improves immune function, improves cognitive function, enhances the quality of your sleep, decreases inflammation, increases your energy and SO MUCH MORE!!! It contributes to your overall well-being. While it may be March Madness for some, I am deeming the month of March to be “March Movement”! Here’s the deal: There are 31 days in March…move your body for at least 20-minutes a day, every single day in March. That’s it. Commit to moving your body every single day in March. It’s that simple. 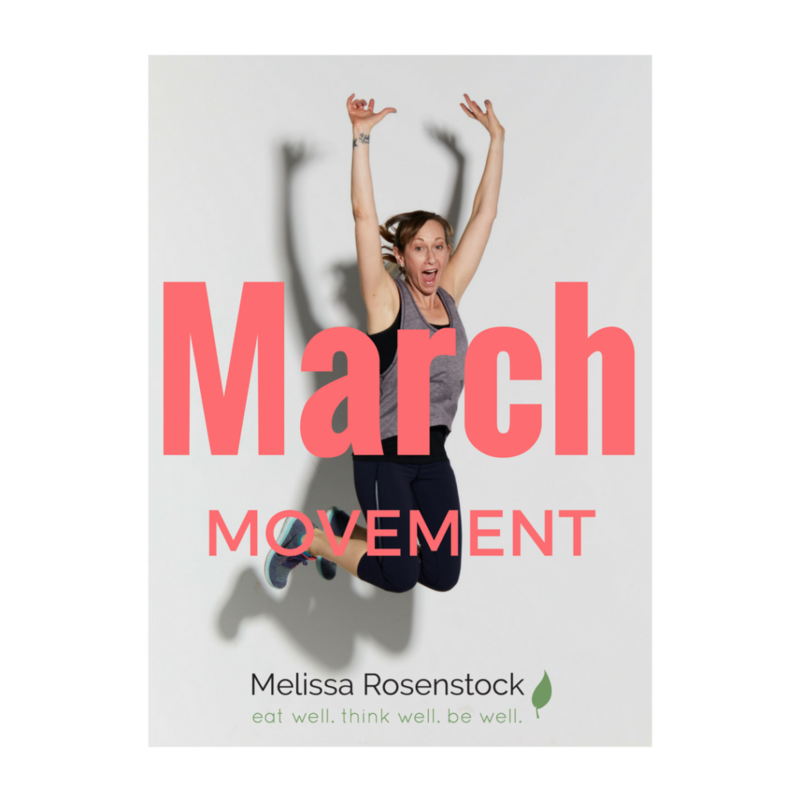 Join March Movement and you’ll have exclusive access to a private FB group, with daily prompts, motivation, my favorite YouTube workouts, hot-seat coaching and more!! So, if you want to be a part of a supportive community that is ready to take March by storm and MOVE IT, then join me. March Movement starts March 1st! Commit to movement and enroll today for only $27!!! Less than a $1/per day!